Sword and Cutlass Wood Displays we have designed and crafted for numerous choices of US Military Sword Displays for your selection. These quality hardwood displays are all custom made, and allow you to display your US Military Sword in a variety of ways. You select the style, the size, the species of hardwood, and you can request most any special laser engraving. We will be happy to discuss with you any special requests or modifications. 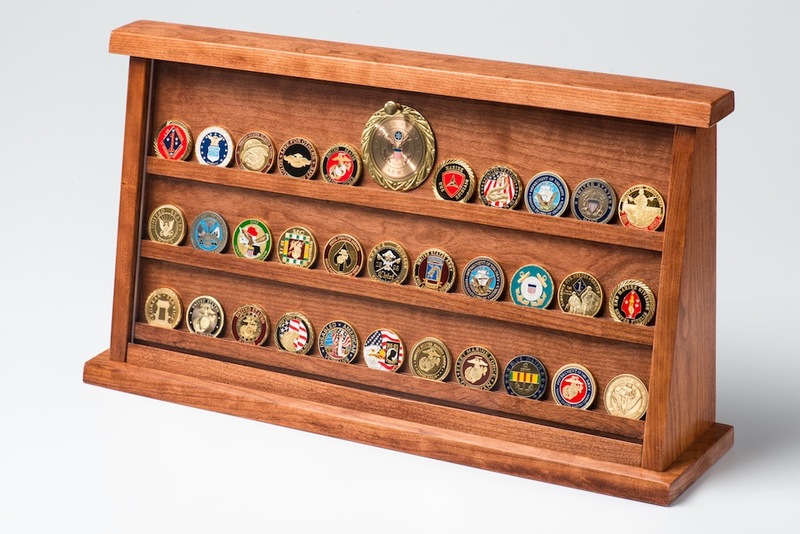 Hardwood Memorial Flag Display Case Designed to protect and display a memorial flag These beautiful Cherry, or Walnut, Flag Display Cases are crafted and finished in our Spokane Valley, WA woodshop. Each Case is made using solid American Hardwood and furniture grade hand rubbed lacquer. Extra strength glass is used to front each case, and your choice of emblem, laser engraved directly to the glass, is included. Personal text can be laser engraved on the glass or on a brass plate. The Flag Display Case is equipped with wall mounting hardware or can be displayed on a shelf, desk, or other flat surface. The hardboard back is easily removed for flag insertion. A solid Hardwood Mounting Base is available. The KaBar Fighting Knife was originally designed by the US Marine Corps Quartermaster as the official fighting knife during the early days of World War Two. The KaBar Knife was soon adopted by the Army, Navy, Coast Guard, and Underwater Demolition Teams, for its service throughout the war, and has seen continued use into the 21st century. . These finely finished hardwood displays, provide three unique ways to display your treasured KaBar Knife. We will be happy to personalize your display with laser engraving on the wood, on the glass door of the Presentation Case, or on a brass plate.